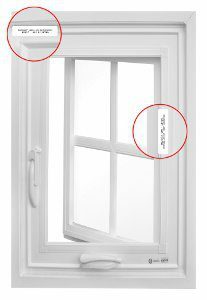 The warranty label for your windows is typically located in the upper left corner of the window frame when looking from the inside. On some models such as the Casement and Awning windows, the label can be found inside the frame on either side when the sash is cranked open. I don't have my warranty label: Enter the date of purchase. When did the problem first begin*? Is this your first service request? Eligible warranty is a function of the written ALLSCO warranty offered at time of purchase, and extends only to the original homeowner and is non-transferable. All ALLSCO Windows and Doors benefit you with a full one-year factory workmanship warranty, which covers general workmanship/labour. Glass breakage (of any kind), damaged screens, door sweeps, door thresholds and rusty screws are NOT covered under this warranty. Product (s) damaged by accident, improper handling and/or storage, settlement or structural building defects. Improper or faulty installation of product (s) – please refer to manufacturers printed instructions. Any misuse or abuse to the product (s) (e.g. painting or use of harmful solvents), or failure to use reasonable maintenance. Glass breakage of any kind is NOT covered under warranty. There is a $100.00 + tax investigation fee to take measurements and/or order replacement parts, should the customer not be able to provide this or it is deemed necessary. If the product is currently under warranty, there is only a $100.00 + tax/hour labor charge to replace product (s). Subse-quent hours $80.00 + tax/hour. If the product is no longer under warranty, there is a $100.00 + tax/hour labor charge plus the cost of parts/materials. Subsequent hours $80.00 + tax/hour. For requested service work, an estimate will be given, and must be deemed accepted, prior to completion of any work. All fees are payable upon completion of the work by cheque or cash. For orders over $500.00 dollars, a 50% deposit is required to be paid prior to the completion of the work. I hereby authorize Allsco to contact my Contractor/Installer for confirmation of the information provided above and to make all necessary repairs. Should the required repairs (labor and/or materials) not be covered under the warranty, I have read and understood all terms, conditions, applicable fees and charges attached to this claim. I hereby acknowledge that the above information is accurate and correct, to the best of my knowledge.